Felix Stephensen is originally from Oslo, Norway, but he now calls London home. Born on July 22, 1990, Stephensen currently makes his living playing poker. He does so playing primarily online under the screenname “FallAtyourFeet,” and according to online tracking records, he is up more than $300,000 since 2011. 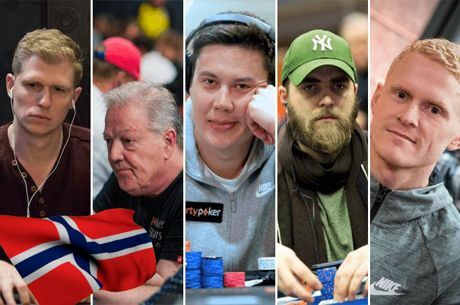 Stephensen, who is good friends with fellow Norwegian online pro Ola “no_Ola” Amundsgard, can usually be found at the $25/$50 pot-limit Omaha tables, though he has been known to take shots as high as $200/$400. As such, he has developed a strong reputation and loyal following in the online poker community. As far as the live realm is concerned, Stephensen had just two cashes on his résumé before making the 2014 World Series of Poker November Nine. The first was a 12th-place finish in the 2009 Norwegian Championships £1,000 No Limit Hold'em Main Event for £3,585, and the other was a 92nd-place finish in the 2013 European Poker Tour Barcelona Main Event for €12,700. As for the 2014 World Series of Poker Main Event, Stephensen traveled to Vegas with friends and ponied up the $10,000 buy-in. He then swapped seven percent with Amundsgard, who ended up finishing 237th in the tournament for $38,634. Stephensen’s 2014 Main Event journey began on Day 1c, and he only managed to bring his starting stack of 30,000 up to 39,350, which put him 1,237 of the 2,571 surviving players. Day 2 was a little better as he chipped up to 120,800, putting him 634 out of 1,864 players. On Day 3, his stack grew to 362,000 – putting him 185 of 746 – and Day 4 he doubled that to 739,000 – 102 of 291. On Day 5, Stephensen worked his stack up to 1.355 million, but that was only good for 56th out of the surviving 79 players. Finally, on Day 6, Stephensen got out of the doldrums and managed to amass a respectable stack of 7.74 million, which put him ninth in chips among the final 27 players. That stack allowed Stephensen to not only survive, but to thrive as he chipped up to 32.775 million, good for second at the 2014 WSOP November Nine final table. Stephensen ultimately finished runner-up to Martin Jacobson in the Main Event and earned $5,145,968 for his performance.